Let’s face it, there are millions of other YouTube channels out there fighting for viewers. Even if you’re in a very specific niche, there are a ton of other competitors out there. This means that you are going need to create a visual brand that stands above the others. Or your interesting YouTube videos are going to be missed. Creating a custom YouTube Banner image is a great place to start upgrading your visual brand. Especially, because this is going to be the first visual that new viewers are going to see on your channel. Making a great first impression on those people could turn them into lifelong viewers in a few seconds. 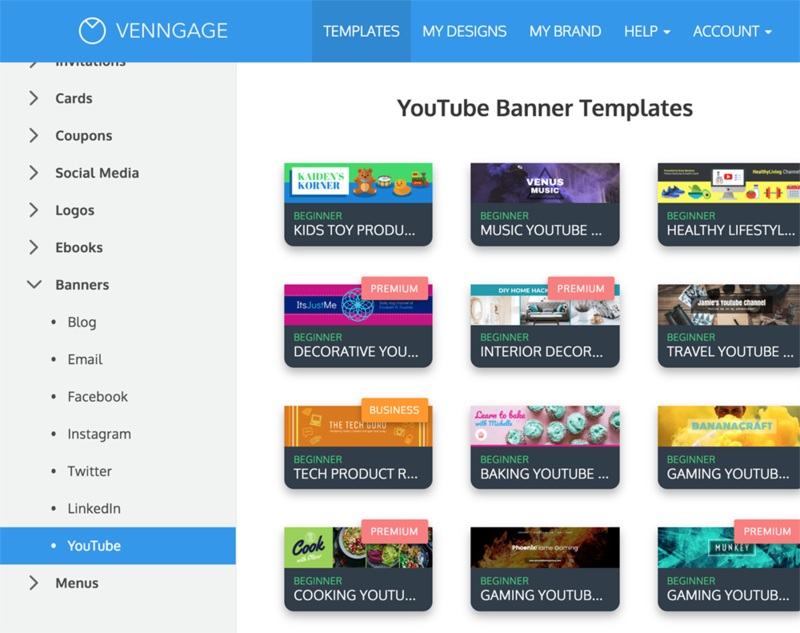 With Venngage you can create a YouTube Banner in a few seconds. And you don’t have to be a professional designer to create a stunning banner. Start with one of our professionally designed YouTube Banner background templates. Add all of your brand colors, logos or other important information to the banner. Or use our collection of millions of icons, stock photos and illustrations to take you banner to the next level. Then download or share it with a single click! Sign up on Venngage for free with an email, Gmail or Facebook account. 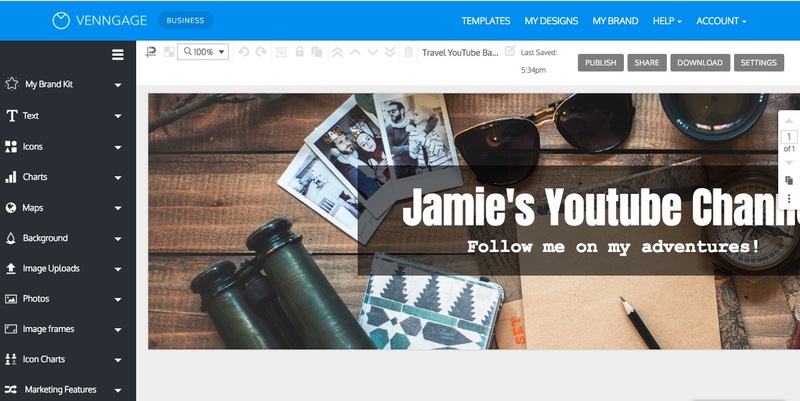 Select the perfect YouTube Banner template for your channel. Add a compelling background image, icons or other eye-catching shapes. Include your channel name, logos or any important brand marks to your banner. 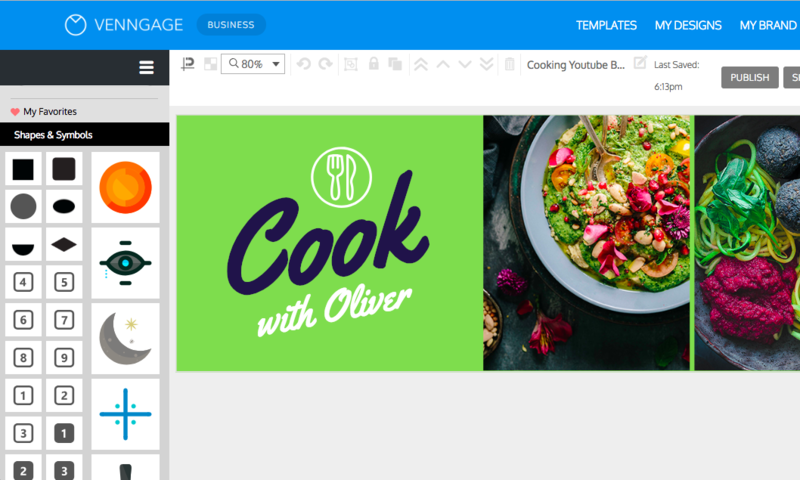 Download your YouTube Banner with a single click, or share it directly with your team. Make your YouTube Banner jump off the screen with a bold color palette. Immediately let people know what channel they are viewing by including your brand name and logo. Use a border, icon or shape to help your channel name stand out. Show viewers exactly what your channel is about with a descriptive background image. Make sure your YouTube banner fits your channel perfectly with our YouTube Banner Maker. 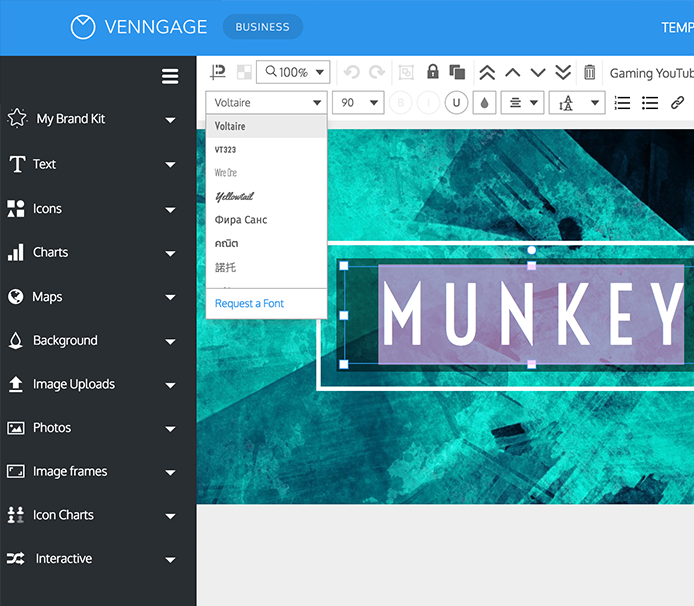 Now with Venngage, you don’t have to be a professional designer to create a winning banner. All you really need is a YouTube channel, a banner template and a little bit of creativity. Every template you see on Venngage came from our professional in-house design team. They have already done the heavy design work, which means you can create a unique YouTube banner in no time. But best of all, each template is completely customizable. Add all your brand colors, logos or other important information with a single click. So what are you waiting for? Instantly show new viewers what your channel is all about with a relevant background image. If you are a tech review channel, maybe pick a futuristic YouTube Banner background. Or a lifestyle channel might need a beatiful travel background image. Whatever your channel may be about, make sure you select a banner background image that fits it perfectly. A successful YouTube Banner includes your YouTube channel name on there at least once. A viewer should know exactly what page they are on from the beginning. And a well designed YouTube banner is going help the channel name stick in their mind extremely well. Additionally, try to include your website or any other important social network handles. That way your viewers can follow or learn more about your brand if they want. You can even add a simple Call To Action if you want to direct them to a certain landing page. Including some borders, icons and shapes can help your YouTube Banner stand out. With a simple border you can direct the viewer's eye to your channel. An icon can be used to highlight a Call To Action. And a background shape will make your channel name pop off the screen. So take the time to add some structure to your YouTube banner before publishing. Your viewers will thank you! Download and share your YouTube Banner with everyone. Once you are finished creating the perfect YouTube Banner, it’s time to share it with the world. 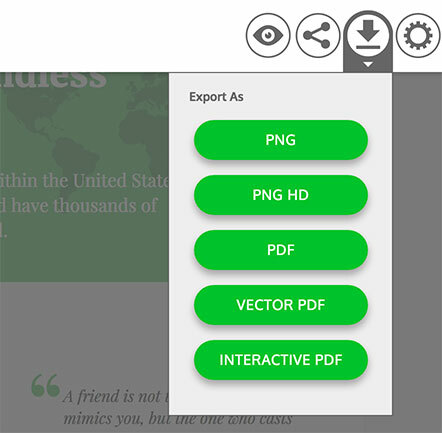 With a single click you can download it as a high-quality PNG or PDF. Then upload it directly your YouTube channel in seconds! Or if you need some feedback, share it directly from Venngage with a unique link and landing page. How do I use the Venngage YouTube Banner Maker? Sign-up for Venngage by joining with your email, Gmail or Facebook account. What kind of YouTube Banner templates do you have? 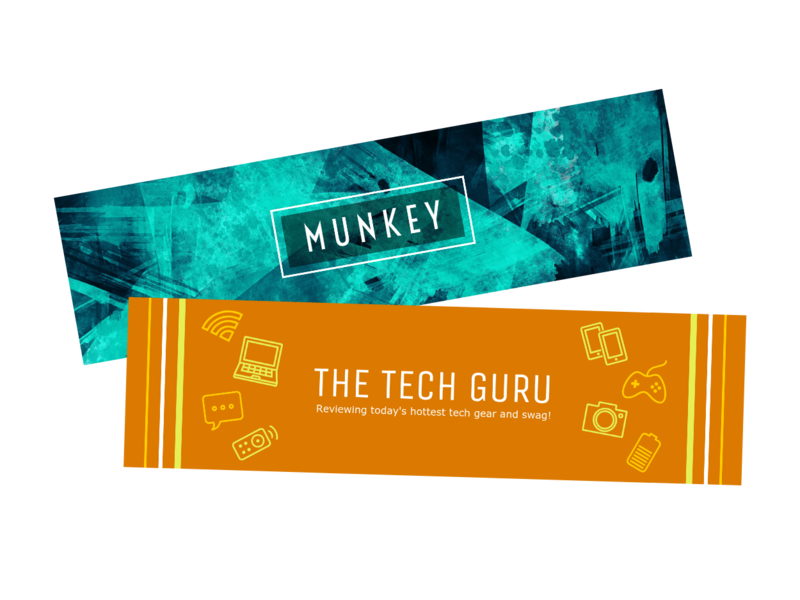 We have banner templates for everything from tech channel to makeup channels, and everything in between. All of these templates have been created by our professional in-house designers as well. How do I download my YouTube Banner? Only one click is needed to download your YouTube Banner as a high-quality PDF or PNG. Didn’t find a template you liked? Check out more templates on our templates page.